Northern Guatemala’s Maya Biosphere Reserve comprises several national parks and other protected areas. Fire activity is concentrated in one park in particular – Laguna del Tigre National Park – where satellite data from NASA recorded more than 400 fires occurring over the past week. Land use is restricted in Guatemalan national parks, but officials say the fires are largely human-caused by illegal cattle ranching, logging, and drug trafficking. Budget challenges have limited the capacity of local institutions to effectively control the forest fires. 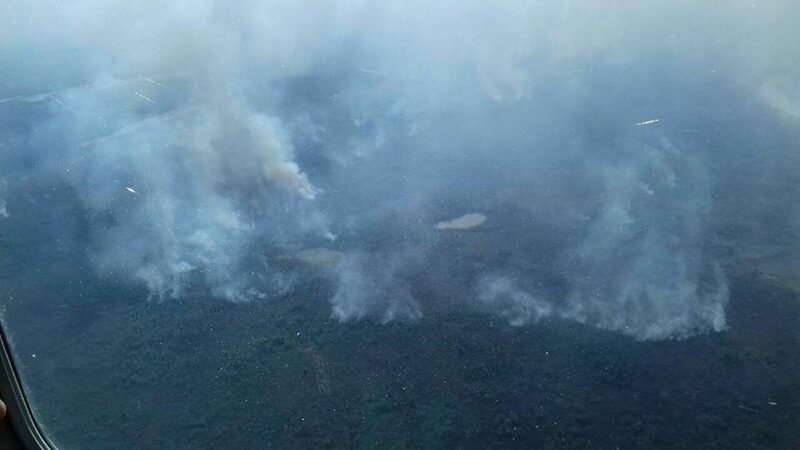 The Guatemalan government issued a red alert for the Peten department Tuesday due to forest fires in national parks inside the Maya Biosphere Reserve. The biosphere reserve covers the northernmost fifth of the country and borders both Mexico and Belize. Along with adjacent areas in those two countries, the Maya Biosphere Reserve is part of one of the largest contiguous tracts of tropical forest north of the Amazon, according to the United Nations. A fire that began Saturday in the Laguna del Tigre National Park has proven to be especially challenging to combat, according to an official government video communiqué. The fires may have already consumed 30,000 hectares of land, according to the National System for the Prevention and Control of Forest Fires (SIPECIF). The red alert enables the mobilization of additional personnel and resources from the national government and other areas of the country to assist local officials, firefighters, and soldiers who have been struggling to get the forest fires under control. “We have two helicopter available that will probably spring into action. We hope they contribute to preventing the expansion of the fires,” Guatemalan vice president Jafeth Cabrera said at a press conference Tuesday. The Ministry of Defense has assigned 200 more soldiers to assist in the firefighting efforts, and seven more SIPECIF firefighters have also been assigned to Peten. The Guatemalan government has also requested support from Mexico. 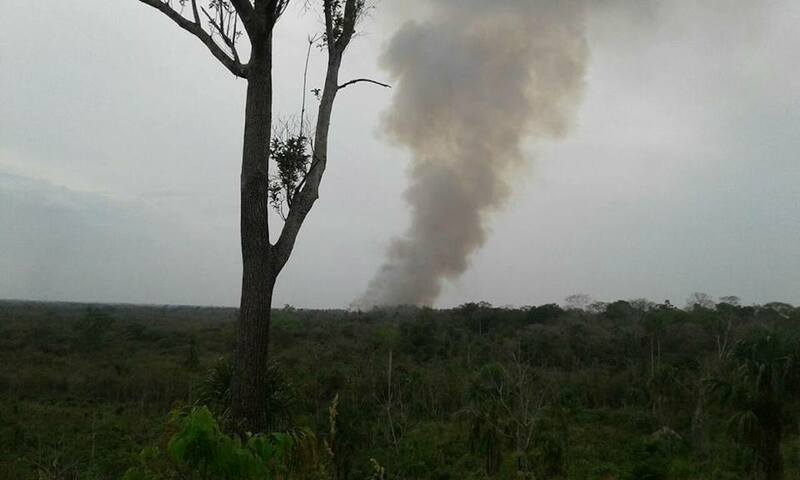 The fires in Peten may have been started intentionally to clear areas for cattle ranching or other illegal activities, government officials speculated. 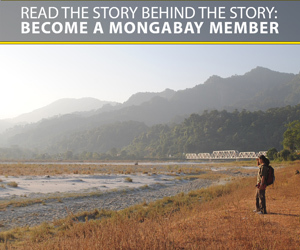 While the Maya Biosphere Reserve is home to success stories like those of certain community forest concessions in the multiple use zone, it is also plagued by serious challenges, including illegal cattle ranching, wildlife poaching, and drug trafficking, particularly in the Laguna del Tigre and Sierra del Lacandón National Parks in the western half of the biosphere reserve. “[The forest fires] could be the actions of drug traffickers to take advantage and build clandestine airstrips,” Cabrera said. Determining whether fires are premeditated is difficult, he said, but human activity is almost always to blame. “Ninety-eight percent of fires are caused by people, by human activity, for various purposes [including] for hunting, for changes in land use,” National Protected Areas Council (CONAP) executive secretary Elder Figueroa said at a separate press conference Tuesday. Few activities are permitted in the Laguna del Tigre National Park, which is the largest core area of the Maya Biosphere Reserve. Still, there are exceptions. Two communities in the park, Maya Q’eqchi’ of Paso Caballos and Buen Samaritano, both have agreements with CONAP and have strictly regulated agricultural areas. Several oil wells and operations were also grandfathered in; however, a 15-year extension to the oil contract the Guatemalan government granted in 2010 generated significant controversy. Along with the largely neglected buffer zone, the Laguna del Tigre National Park has one of the highest deforestation rates of any area in the Maya Biosphere Reserve. Illegal deforestation in the park stems from a range of activities, and is largely concentrated in a swath of territory along the road – now dotted with unregulated settlements – leading to oil extraction operations. Illegal cattle ranching and drug trafficking also drive deforestation in the area, according to government officials. According to satellite data from NASA visualized on Global Forest Watch, 443 fires were detected in Laguna del Tigre National Park between April 4 and 11. Global Forest Watch shows fires occurring in and around Maya Biosphere Reserve between April 4 11, 2017. Many are concentrated in Laguna del Tigre National Park, where a clusters of fires are burning in forest near Guatemala’s last scarlet macaw breeding site. Official Guatemalan government data differs from that of Global Forest Watch, which registers individual hotspots and fires regardless of how and why they are burning, whereas the government data distinguishes between agricultural burns and forest fires, and likely register clusters of individual hotspots and fires as one forest fire. According to the Guatemalan government, there have been 407 forest fires since the beginning of this year, and the Peten and Quiche departments have been especially affected. One of the forest fires of particular concern in the Laguna del Tigre National Park is in the area of El Perú-Waka’, an important Mayan archaeological site. The last remaining scarlet macaw (Ara macao) nesting area in Guatemala is located in that same area. The park is also home to more than 180 other bird species, the endangered Baird’s tapir (Tapirus bairdii), and iconic near-threatened species like the jaguar (Panthera onca). “It’s worrisome that [the fires] are destroying virgin forest,” Alma Polanco Solís, the regional CONAP director for the Peten, told Guatemalan newspaper Prensa Libre. “If it’s not fought, it could affect the only scarlet macaw nesting area,” she said. Budget challenges have limited the capacity of local institutions to effectively control the forest fires. CONAP has wide-ranging management responsibilities in more than 300 protected areas covering roughly 30 percent of Guatemalan territory, but has only received roughly 0.15 percent of the national budget in recent years. CONAP has requested an additional 40 million quetzales ($5.45 million) for SIPECIF, Figueroa said Tuesday. However, concerns about the lack of funding for forest firefighting were raised months ago, before the worst of the forest fire season. In January, SIPECIF officials presented a request to the Ministry of Finance for an additional $1.09 million, Nery Franco, the SIPECIF regional director for the Peten, told a local Peten media site this past February, when SIPECIF and other institutions created a Coordination Commission for Forest Fires. The additional funds would have doubled SIPECIF’s annual budget, which was basically only enough to cover limited personnel, according to Franco. “We don’t really have a way to cover the whole operational side of things at the moment,” Franco said. In past years, SIPECIF has had at least 140 personnel, he said, but this year there are only 70 people: 62 operational staff (firefighters), seven technical staff, and one administrator. Additional government and army personnel and resources continued to arrive to the region Wednesday morning, and firefighting activities continue.